which is known as the Bingham model: The parameter τo is the yield stress, and it represents the shear stress required to initiate flow. The slope of the line is the plastic viscosity, µ, and it affects the resistance to flow after the yield stress has been surpassed. These two parameters, which define the flow curve, provide a complete description of the flow behavior of a fluid. 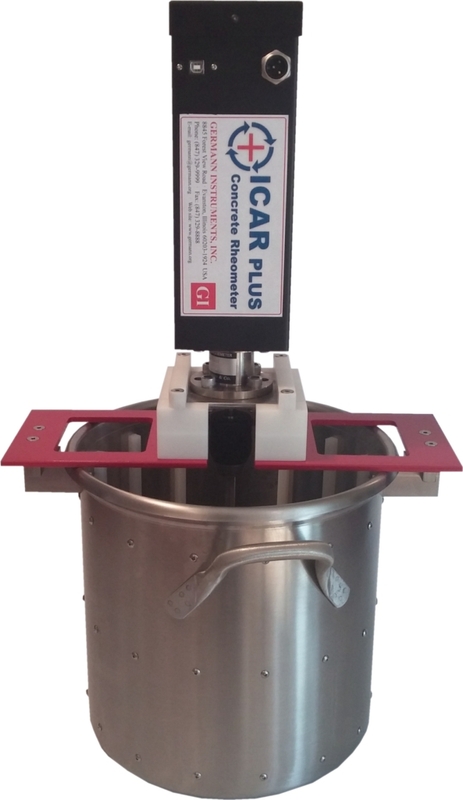 The ICAR Plus Rheometer is designed to characterize the static yield stress, the dynamic yield stress and plastic viscosity of the concrete. A high static yield stress is desirable because it reduces formwork pressure and increases the resistance to segregation. But for ease of pumping, placement, and self-consolidation, a low dynamic yield stress is necessary. The dynamic viscosity provides cohesiveness and contributes to reducing segregation when concrete is flowing. 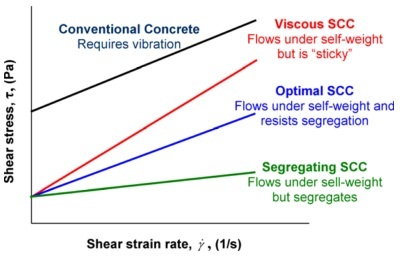 The schematic plot to the right shows dynamic flow curves for conventional concrete and different types of self-consolidating concrete (SCC) mixtures. The conventional concrete has a high dynamic yield stress and additional energy (vibration) is needed to consolidate the concrete after it is placed in forms. The self-consolidating mixtures all have low dynamic yield stress and will consolidate due to self-weight, but they have different rheological properties. The SCC with a high plastic viscosity (red line) will be sticky and difficult to place and strike off. On the other hand, the mixture with low plastic viscosity (green line) will be prone to segregation. Thus by determining the dynamic flow curves of concretes with different mixture proportions and type of admixtures, and optimum balance between ease of flow and resistance to segregation can be realized. These types of determinations cannot be done using conventional slump-based tests. 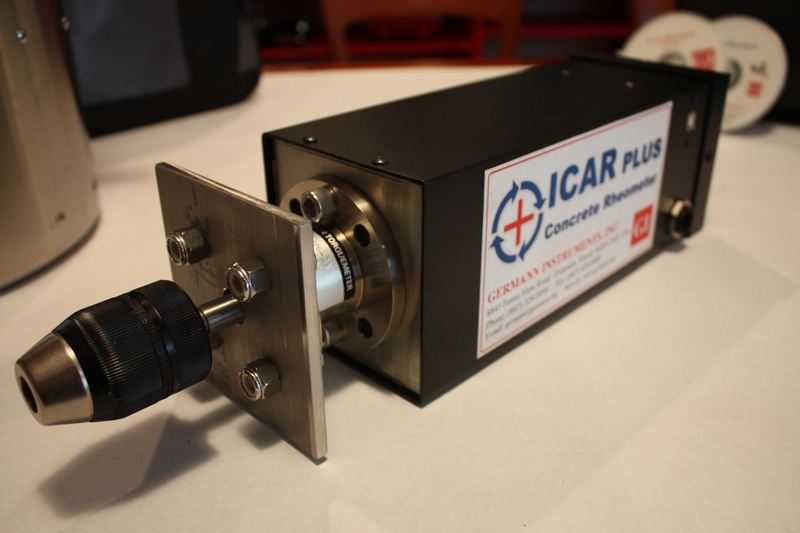 The ICAR Plus Rheometer is the successor to the ICAR Rheometer. This device is provided with a stronger motor, digital based electronics and more comprehensive software. The main advantage of the ICAR Plus is its digital verification process, allowing users to always have a ready to use system under any environment and working condition. 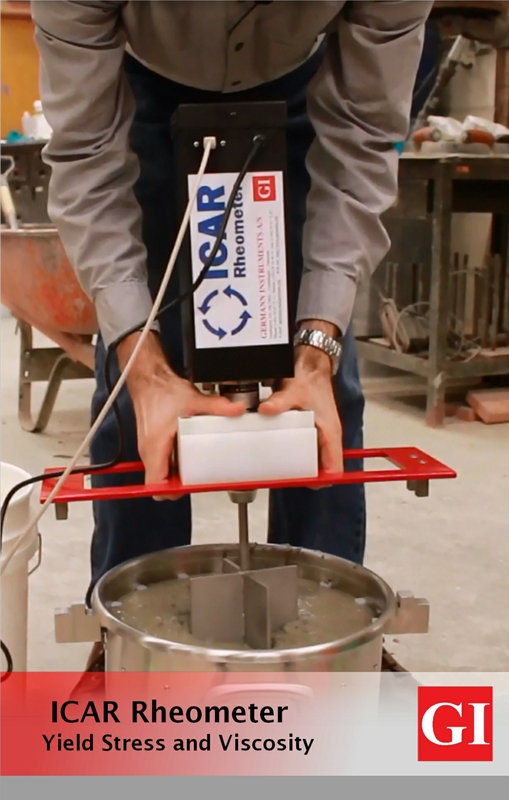 ICAR Plus will always be calibrated by the user on-site and can be verified in the laboratory with the same silicone as its predecessor ICAR Rheometer. 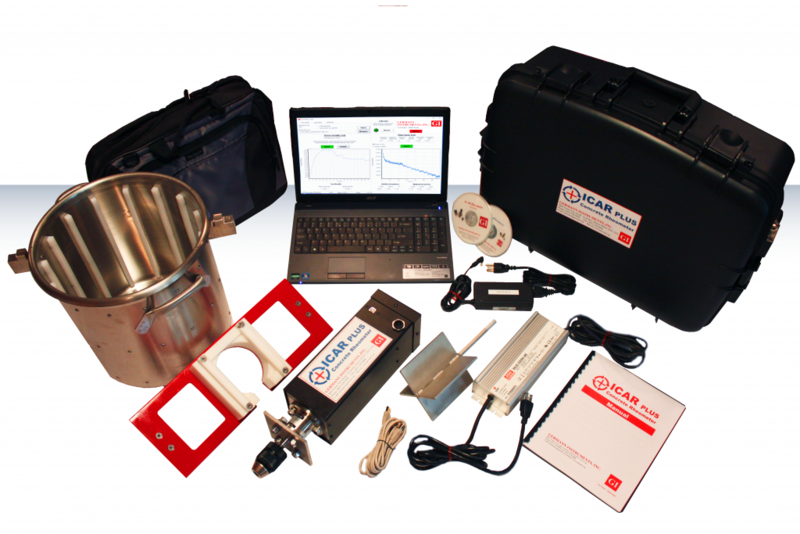 The ICAR Plus Rheometer is composed of a container to hold the fresh concrete, a driver head that includes an electric motor and torque meter; a four-blade vane that is held by the chuck on the driver; a frame to attach the driver/vane assembly to the top of the container; and a laptop computer to operate the driver, record the torque during the test, and calculate the flow curve parameters. The container contains a series of vertical rods around the perimeter to prevent slipping of the concrete along the container wall during the test. The size of the container and length of the vane shaft are selected based on the nominal maximum size of the aggregate. The vane diameter and height are both 127 mm. Two types of tests are performed. The first type is a stress growth test in which the vane is rotated at a constant slow speed of 0.025 rev/s. The initial increase of torque is measured as a function of time. 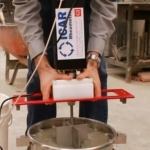 The maximum torque measured during this test is used to calculate the static yield stress. 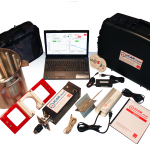 The other type of test is a flow curve test to determine the dynamic yield stress and the plastic viscosity. 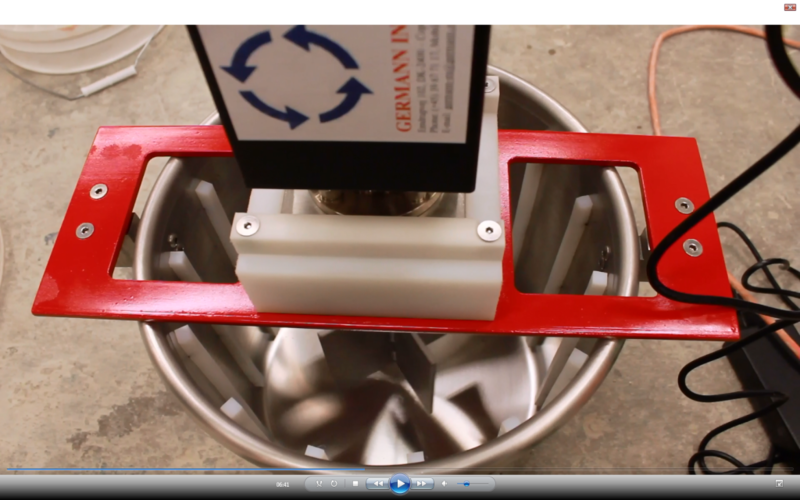 The flow curve test begins with a “breakdown” period in which the vane is rotated at maximum speed. This is done to breakdown any thixotropic structure that may exist and to provide a consistent shearing history before measuring the Bingham parameters. The vane speed is then decreased in a specified number of steps, which is selected by the user but at least six steps are recommended. 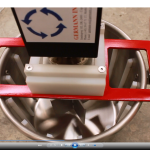 During each step, the vane speed is held constant and the average speed and torque are recorded. The plot of torque versus speed of vane rotation defines the flow curve from which the Bingham parameters are calculated. 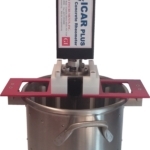 The ICAR Plus Rheometer software performs all the necessary functions: operates the driver, records the torque, computes test results, and stores data. The entire testing is controlled from a single screen as shown below. 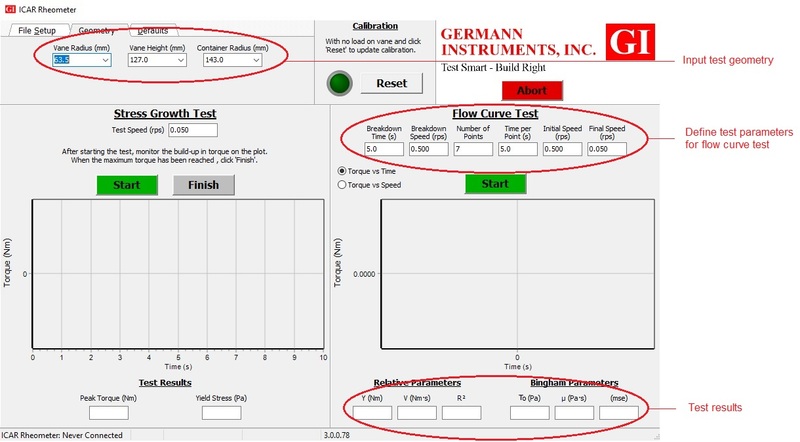 The user defines the test geometry and provides the test parameters to run the flow curve test. A simple press of the “Start” button initiates the stress growth test and flow curve test is started by pressing the second “Start” button. Both tests are completed within 1 minute. The figure below on the left shows the results of a stress growth test. The program uses the peak torque and test geometry to calculate the static yield stress, which is displayed at the bottom of the computer display. The figure on the right shows the average torque versus average vane rotation measured during six steps of the flow curve test. The software computes a best-fit line to the data and reports the intercept and slope as relative parameters. Based on the test geometry, the software computes the Bingham parameters: dynamic yield stress and plastic viscosity. *Size provided if another size is not specified.